Many Scottish runners had parents, siblings and children who also enjoyed the sport. The most successful surname must be Stewart: Lachie and his son Glen from Glasgow; the unrelated Peter and his siblings Ian and Mary from Birmingham – all five GB International athletes. Aberdeen has Mel Edwards and his son Myles. But the battle for top running family has been most intense in the Dundee area. Liz McColgan and her daughter Eilish; Doug Gunstone, his wife Palm, his sister Penny and his son Neil. But the Hasketts take some beating. Christine Haskett represented Scotland in the ICCU or IAAF World Cross Country Championships no less than 14 times; her brother Charlie ran the IAAF event six times; and now his son Mark is showing that he may have the talent to emulate the achievements of his father and his aunt. Christine Haskett was born on the 30th of November 1952. Her father Charles, known as Chick, had been involved in athletics before and during the Second World War, particularly with Dundee Hawkhill Harriers, a club that trained in and around Caird Park, which had its own running track. When interviewed in early 1987 by Doug Gillon for ‘Scotland’s Runner’ magazine, Chris recalled her first race in 1968. “It was for the Hawks against Dundee University on a very bumpy grass track. I ran about 2.20 for 880 yards.” Harry Bennett (who went on to tutor Liz Lynch / McColgan), became Chris’s coach. She was second in the Scottish Intermediate 880 yards that year. Her progress was extremely rapid. In the 1969 Scottish Under-17 CC she finished second but a long way behind Rose Murphy of Bathgate Harriers. However that summer she reduced her 800m personal best to 2.15.1. 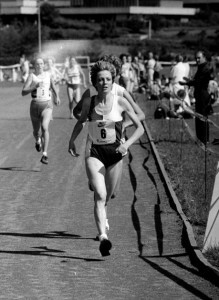 Although Sandra Sutherland of ESH topped the Intermediate yearlist with 2.14.2 (defeating Haskett for the first time in the WAAA Championships), Christine “the slimly built Dundee girl showed brilliant form in Scotland, annexing four major titles” – the East District, East v West, Scottish Schools and SWAAA championships. 1970 was a fantastic year for Christine Haskett. In the Scottish Senior CC, at the tender age of seventeen, she was a very close second, sharing the winning time of Margaret MacSherry (Cambridge Harriers). Jim Logan reported: “They quickly moved away from the field – MacSherry leading with Haskett about ten yards behind. With a mile left, Christine made her challenge, but MacSherry resisted and they passed and re-passed until at 200 yards MacSherry made what appeared to be the decisive move. Christine guttily came again and the two girls fought all the way to the line, both clocking 26.00 but with MacSherry a whisker in front.” These two athletes were to be close rivals for several years. The SATS Yearbook reports: “The 1500 metres was completely dominated in 1970 from a Scottish point of view by two runners, Margaret MacSherry and Christine Haskett, who between them re-wrote the Scottish records: Margaret the National, lowering the time to 4.22.4; and Christine the Native, which she reduced in stages from 4.42.3 to 4.40.9, 4.30.8 and 4.23.8. Her time in the CG final was a new UK age-best and she was chosen to compete for GB in the European Junior Championships in Paris (where she won a silver medal) and in the match v West Germany at Leicester (finishing third).” Before the Games, Christine won the 1500m in the East District Championship and the East v West, before coming second, just half a second behind Margaret, in the SWAAA event, which sealed her selection for the Games. In the Eleventh British Commonwealth Games in Meadowbank Stadium, Edinburgh, on the 25th of July, Chris, who was still only seventeen, set a very good new 1500m personal best (4.23.8) in 8th place, just one place behind Margaret MacSherry (4.23.6). The winner was England’s Rita Ridley in 4.18.8. Chris finished the season with a win over 800m (2.14.3) back home at Caird Park. She reminisced in 1987 that she was lucky, because her time in the Scottish was point eight of a second over the qualifying time, but the selectors did choose her for the Games. At 17 she was not the youngest – sprinter Helen Golden and long jumper Moira Walls were both her junior – but she was the lightest. She knows that because she was selected as the athlete to stand at the top of the ladder which Dave Wilson, Ricky Taylor, Dave Kidner and others carried round the Meadowbank Stadium in that marvellously spontaneous closing ceremony. In the 1971 Scottish Senior CC, Chris Haskett took revenge on Margaret MacSherry, “scoring a runaway win on her home course at Dundee. She won the three and three-quarter mile race by over a minute.” The first six were chosen for the International CC in San Sebastian, where Christine finished an excellent sixth. During the track season she improved her 800m time to 2.09.5; and won the East v West, followed by gold in the SWAAA 1500m. Her season’s bests were a list-topping 4.25.4 for 1500m at Crystal Palace; and a Scottish National Record of 4.49.4 for one mile. The 1972 Scottish Senior CC featured a close battle between Chris Haskett and the newly-married Margaret Coomber. This time it was Margaret who regained her title by 12 seconds – her final victory over Chris in this championship. The track season produced the following times for Chris Haskett: 800m 2.08.1; 1500m 4.25.5; 3000m 9.40.4 (a Scottish National record). She won the Scottish WAAA 1500m title plus the East v West race and was ranked top in the Scottish yearlist. However she suffered from lack of top-class competition at international level. Chris Haskett regained her Scottish CC title in 1973 with a clear win over Margaret Coomber. However Mary Stewart dominated the track season, and Chris’s best mark was 4.25.6 for 1500m. Her lack of form meant that she was not selected for the Commonwealth Games at Christchurch, where Mary Stewart finished fourth in the 1500m in a new Scottish National record of 4.14.7. Although Chris lost her Scottish CC title in 1974 when finishing second to Moira O’Boyle, she enjoyed her best track season since 1970. At the SWAAA Championships at Meadowbank on 22nd June, Chris secured a rare double: 1500m in 4.24.4 and 3000m in 9.36.0 – both crushing victories. She produced new personal bests with 4.18.8 and 9.32.0 (a Scottish National record). Chris had the top eight 3000m performances in the Scottish yearlist. 1975 continued this success. Chris Haskett not only regained her Scottish CC title (the first of three in succession) but also repeated her double success in the SWAAA championships with gold medals for 1500m (4.21.6 – a Scottish Native record) and 3000m. Earlier she had set a 3000m Scottish Native record of 9.24.6 at Meadowbank. Then in the WAAA championships at Crystal Palace on the 18th of July she won a valiant silver medal behind Ireland’s Mary Purcell in a Scottish National record of 9.18.4. Once more, she had the top eight performances in the Scottish 3000m yearlist. 1974 and 1975 proved to be the peak years for Christine Haskett, although she continued to be successful until 1993! She won the Scottish 3000m title in 1976 and also retained her Scottish CC championship in 1976 (defeating Moira O’Boyle) and 1977 (in front of Margaret Coomber). By 1979 she was married and running as Christine Price. Next year she switched clubs to Bolton United Harriers. 1981 produced a good 3000m time of 9.31.1. Then in 1982 she won the Scottish CC title for the sixth time, twenty seconds ahead of a certain Elizabeth Lynch of her old club Dundee Hawkhill Harriers. That summer Christine’s 3000m best was 9.24.39, although she continued to race only south of the border. Chris moved back to Dundee and by 1986 was competing for DHH once again. In both 1986 and 1987 she was second in the Scottish CC championships and in the latter year, along with her brother Charlie Haskett, Christine Price was part of the final Scottish team which was permitted to take part in the World CC Championships. As Colin Shields reported: “This was at the Sluzewiec Racecourse in Warsaw, Poland, in dreadful conditions on a slippery muddy surface in sub zero weather. Amongst the Scots, only Liz Lynch (who won a silver medal) ran really well.” However Christine Price could take justifiable pride in her record fourteenth appearance for Scotland in this competition (or its International CC precursor). On the track, the creation of 10,000m races for women offered Chris Haskett-Price a further chance of a Commonwealth Games place, sixteen years after her first. In 1985 she won two gold medals in the SWAAA Championship: 5000m in 16.35.7; and 10,000m in 35.10.42. In 1986, after retaining her Scottish 10,000m title in 35.02.33, she was selected for the 1986 Commonwealth Games in Edinburgh. In Meadowbank Stadium, on the 28th o f July, Chris ran well to finish tenth in a personal best of 33.59.90. It was a great day for the Scots, since Liz Lynch won the gold medal. Even well after their peaks, many runners continue competing or at least trying to keep fit. Christine Haskett-Price always wore the Scottish vest with distinction and in November 1993 she took part in the Home Countries (5 Nations) International Veterans Cross Country Championship over a dry course in an estate outside Cardiff. Chris was competitive all the way and eventually finished second overall, just 13 seconds down on the W35 victor for England, Margaret Eldridge. However Chris was ten seconds clear in the battle for W40 honours and became one of the very few individual winners for Scotland in this annual and most prestigious event in British Veteran Athletics. Christine Haskett-Price enjoyed a long and distinguished career, winning many championships and enthralling spectators with her grace and fighting spirit. Dundee and Scotland should be very proud of her.